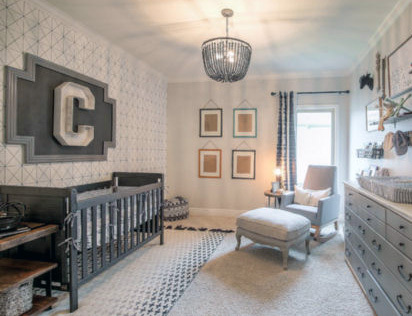 Little Black Dresser is sharing her bright black and white masculine baby nursery ideas for a boy via the photos of this beautiful decorated room. Go here to see the most popular baby shower gift that costs less than $20! At first glance, there is a tried and true decorating tip for visually widening a long, narrow room. There is also a delightfully masculine arrangement of wall decor that our visitors will want to duplicate in their decorating projects. Photo by Little Black Dresser LLC - See more pictures below! The rustic ebony convertible crib is a perfect fit for the style and color scheme of this baby boy nursery design. Expect the color of this crib to be almost black. Parents have indicated that they were looking for a bed in deep charcoal grey and were surprised that it was darker than they expected. 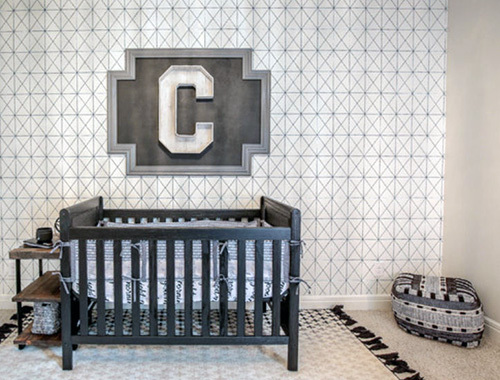 The large, framed letter "C" behind the baby's crib is an easy DIY project for woodworkers. What? No saw? You can make something similar even without a table saw or woodworking skills. Here is a tutorial for nursery wall letters with lights! If you have a craft knife and a few skills you can have your local frame shop build a wooden frame or upcycle a large frame picked up at a secondhand store and then mount your handmade marquee letters yourself. 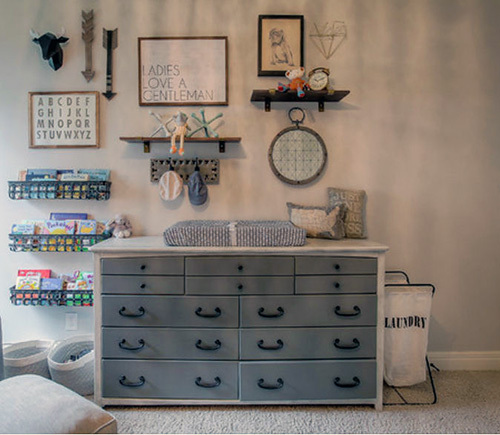 The arrangement of art over the baby's changing table is where the Little Black Dresser's black and white masculine baby nursery ideas really shine. Colorful toys on floating shelves, rustic items in various shapes and sizes such as wooden arrows and a faux animal add an additional dimension to framed art prints. One quote seen in the display should, in my humble opinion, be included in every young man's room, "Ladies Love a Gentleman". The exterior portion of the dresser that serves as baby's changing station is bright white with the drawers painted a contrasting medium shade of grey that allows the glossy, black of the handles to stand out. Please take a moment to let Unique Baby Gear Ideas know which of the nursery decorating ideas in this tour were your favorites and we are always interested in seeing pictures of your projects if you would like to visit our feature page and upload a couple to help others new to DIY, arts and crafts. Join in and write your own page! It's easy to do. How? Simply click here to return to BLACK and WHITE NURSERY PICTURES and IDEAS.